Utilities systems at oil refineries and other large industrial complexes such as pulp and paper mills or chemical plants are very big energy users that have many degrees of freedom. Manipulating these degrees of freedom with the advice of a cost based optimization program usually can result in significant savings in operating costs with small investment needs. This is particularly important within the electrical deregulation context. Since the electrical system is the main economic trade-off with a steam system, electrical deregulation provides many new challenges in order to operate the combined systems at the minimum overall cost. Several of the key optimization problems found in a typical oil refinery steam system such as boilers, extraction-condensing turbines, co-generation and turbine/motors spare drivers are discussed and how those problems can be handled properly is described. Refineries and petrochemical plants usually operate large and complex utilities systems. For example, they utilize different kind of fuels, several cogeneration units, many steam pressure levels, different kind of consumers and there are emission limits to be observed. These complex utilities systems have several degrees of freedom. Manipulating these degrees of freedom with a cost based optimisation program usually can result in significant savings in operating costs. This is particularly important within current deregulated electrical markets. Since the electrical system poses one of the main economic trade-offs with a steam system, electrical deregulation provides many new challenges to operate the overall combined system at minimum cost. Other important aspect is that utilities systems are continuously evolving (there are frequent changes) and also, sometimes there is a lack of sensors that need to be addressed properly. Furthermore, utilities systems have several constraints coming usually from the operations side. For example, maximum flows and steam cushions. Finally it is important to mention the difficulties that exist in the coordination among plant areas. In large complexes, operators are generally not concerned about global energy costs reductions but only about the Unit(s) under his/her responsibility. All the items mentioned above have been successfully addressed in more than 30 industrial complexes, since 1997. The purpose of this paper is to comment some facts and lessons learned during the implementation of the on line technology utilized to reduce energy costs. Since the availability of this kind of systems is recent, there is a lack of articles explaining these aspects. This paper will not focus on software features, on-line optimization technology or detail economic results, which have already been reported (Ruiz et al., 2004). Instead this paper will initially review optimization and constrained variables explaining some optimization examples. Finally, some human and organizational aspects are commented. Optimization variables are those variables where you have a relatively free choice on what that value might be. For example, the steam rate at which a particular boiler operates is a free choice as long as the total steam production is satisfied, thus each boiler flow can be optimized such that the most efficient boilers production is maximized. There are two kinds of optimization variables that can be handled when optimizing a steam system. Continuous variables, such as steam production from a fired boiler or steam flow through a steam driven turbogenerator. It is also important to determine if the unit should be shutdown recognizing its minimum operating limit. Discrete variables, where the optimizer has to basically decide if a particular piece of equipment will operate or not. The most common occurrence of this kind of optimization in refinery steam system is spared pump optimization where you have to choose which of two pumps to operate, one of which is driven by a steam turbine and the other by an electrical motor. Direct Equipment Constraints. An example of a direct equipment constraint is a turbogenerator power output. In a turbogenerator you may optimize the steam flows through the generator within specified flow limits but there will also be a maximum power production limit. Abstract Constraints. An abstract constraint is one where the variable is not directly measured in the system or a constraint that is not a function of a single piece of equipment. An example of this type of constraint is steam cushion (or excess steam production capacity). Steam cushion is a measure of the excess capacity in the system. If this kind of constraint were not utilized then an optimizer would usually recommend that the absolute minimum number of steam producers be operated. This is unsafe because the failure of one of the units could shutdown the entire facility. An on-line line method of measuring efficiency. A method that independently measures the efficiency of each fuel. Accurate costs of the respective fuels. A constraint that accurately limits the total consumption of the respective fuels. These limits may be specified by a "have to burn or fuel gas" limit on the lower limit and an emission limit on maximum limit. These factors are important to capture because dual fuel optimizations are not just controlled by the relative boiler efficiencies but also by the costs of the fuels. They are limited by real constraints in the refinery, which specify that so much of a particular fuel must be burned in the refinery because it is produced as a by-product in the refinery and it cannot be sold, so it must be burned. In the European Union and US refineries, this is typically a fuel gas constraint. There may also be a total limit on the cheap internal fuel source as well. The intersection of all these variables provides a very complex optimization that can have very profound economics. When a boiler optimization allows boilers to shut down you must deal with a constraint on the steam production spare capacity (sometimes known as steam cushion). If you don't deal with this an optimizer will tend to aggressively shutdown boilers until you will have very little spare capacity. This may be the minimum operating cost method to operate the steam system but it is not operationally robust. Without some spare capacity built into the system, a small steam failure could cascade into an entire facility shutdown. Underneath we will see how to deal with the steam production cushion constraint. Here is how to select values for the minimum of the Total Spare Capacity constraint. This number is basically an insurance policy. The larger the number, the safer the operation. Higher values, however, cost money because it makes you run more equipment then absolutely necessary and typically there are large savings from shutting down your most inefficient steam producers. A value of 0.0 indicates no spare capacity. If any boiler trips you cannot supply the steam required by the plant. A conservative number to use is the maximum capacity of the largest steam generator on-line. Then, if your largest generator fails, you will be insured that you have enough spare capacity on-line to service the facility. 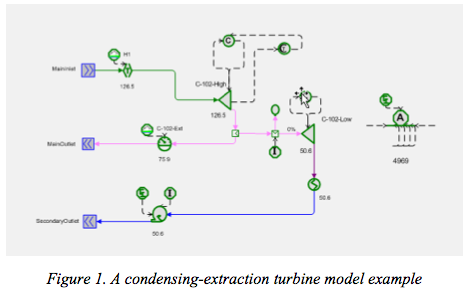 Optimizing Extraction/Condensing drive turbines is very common especially in ethylene plants. The compressor drives are typically > 10,000 HP. On a drive turbine the mechanical power of the turbine must remain constant (the process is expecting a constant power output). Figure 1 shows an example: A single condensing extraction turbine is modelled as two separate turbines (one from throttle pressure to the extraction pressure and one from the extraction to vacuum pressure). The accumulator component on the far right calculates the total power from the drive turbine. The constraint above it is an equality constraint on mechanical power. This insures that the mechanical power of the unit remains constant at all times during optimization. The correct mechanical power is determined from the simulation results. In many turbine optimizations like this there are two degrees of freedom to optimize but we know all three flows. Selecting which flows to optimize is usually not important for the optimization. 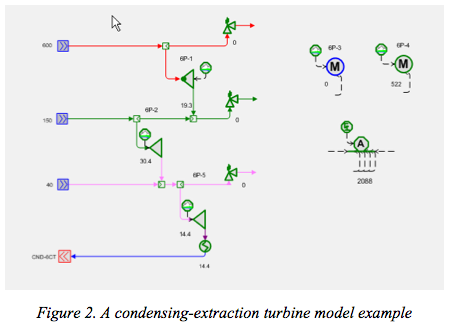 In this case we selected the optimization of the high-pressure turbine throttle flow and the low-pressure turbine exhaust flow. The extraction steam is determined by difference and is limited within its operating limits with the constraint block. It is very important on condensing turbines like this on to know the surface condenser pressure accurately. The amount of power produced in the low-pressure section of the turbine is extremely sensitive to this number. Good efficiency curves are also important to have, especially if there are multiple, parallel drives turbines in the system. The drives optimized typically will not be very large (> 100 HP but < 1000 HP) because large process driver like a compressor are two expensive to spare. There will be lots of drives to optimize. An older refinery that has small turbine drives might have several hundred in the plant. The process will dictate how many drives to operate and the optimizer will only need to select the correct ones. Example Figure 2 shows an example of a set of cooling tower pump drives. There are four 500 HP pumps. One is driven by a high pressure to medium pressure back pressure turbine, one by a high pressure to condensing turbine and two by motors. Currently, three of the pumps are running (the two turbines and one motor). The optimizer can manipulate the pumps but must maintain three in operation. Optimizers are connected to each of the drives. These optimizer icons instruct the overall site optimizer to determine if the respective pumps operate. It also has the built in intelligence to simplify the optimization. For example if all the drives in a group were operating it would make the optimizers unavailable because there are no options. You must run all drives. The constraint hooked to the accumulator is either an equality or a minimum constraint on the total mechanical power of all operating pumps. In other words, it requires the optimizer to maintain at least as much total mechanical power from all pumps at the end of the optimization as current operation requires. The most important sensors to implement in the system are those involved directly in optimization, such as boiler flows, letdown and turbo generators flows. Important sensors are those which provide data to the model that is not changed by optimization. Less important are those sensors only utilized for monitoring and that do not participate in the modelling. Pump status is often a manual entry, unless where it is possible to determine the pump status automatically especially for pumps directly involved in optimization. The status can be inferred from many sources (RPM, flow or standby status). It is important to emphasize the high involvement and motivation of plant operators right from the beginning of the implementation project. The complete set of optimization recommendations must be taken into account. Options that cannot be implemented in practice are removed during modelling phase. Coordination among plant areas in order to implement the proposed optimization recommendations is also a critical issue, so management involvement is crucial. The robustness of the tool has helped operators gain confidence in the system. Final user's acceptance and widespread use, for both engineers and operators, is one of the key issues for an implementation to be considered successful. In this paper, some key optimization problems from experience of implementing a cost based optimization program at oil refineries and petrochemical complexes have been presented. Typical scenarios at oil refinery steam system such as boilers, extraction-condensing turbines, co-generation and turbine/motors spare drivers have been discussed and how those problems can be handled properly is described. Finally, some implementation aspects have been mentioned. 1. Fan, Y., S. Sarkar and L. Lasdon, 1998, Experiments with Sucessive Quadratic Programming Algorithms, Journal of Optimization Theory and Applications 56, 3. 2. Nelson, D., S. Delk and G. Roseme, 2000, Using Visual MESA to Optimize Refinery Steam Systems, AIChE 2000 Spring Meeting, Session T9013. 3. Ruiz, D., C. Ruiz, D. Nelson, G. Roseme, M. Lázaro and M. Sartaguda, 2004, Energy Costs Reduction By Using and On line Utilities Optimization Tool, ERTC Computing 2004.